Bonnie Lass: A status update! Issue 1 of Volume 2 should wrap up within the next week or so! Things are moving along quite well! I owe a lot of that credit to the convenience and intuitiveness of Manga Studio. Most of the processes have taken less than a week to do 22 pages each, and that stat is still blowing my mind…! And since artwork and final compositing for that first issue will be done pretty soon, we needed to have issue two scripted so I'd have something to jump right into for Februrary (wondering now if I can beat the calendar and have artwork for #2 finished in 29 days; I'm thinking yes). 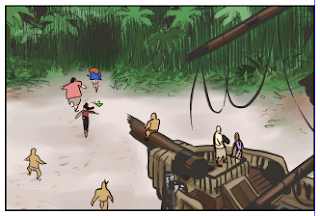 And with that, I'll leave you with a preview panel from early in the first issue of volume two (don't worry! Hoping to have an actual subtitle fairly soon!) which offers a WIP glimpse at how I'm handling the backgrounds in this arc. And one final word before ending this entry: Thank you to anyone who donated to Comic Creators for Freedom this year! I believe somewhere in the neighborhood of $7500 were raised, to help fight human trafficking! Special thanks to Andrew Leslie (@dethfilm) of the Freakin' Awesome Network for interviewing me earlier this week and helping spread the word about the donation drive! I look forward to being able to contribute to the cause next year, and I hope you will too!